Pneumonia is an inflammatory illness of the lung. Frequently, it is described as lung parenchyma/alveolar inflammation and abnormal alveolar filling with fluid. The alveoli are microscopic air-filled sacs in the lungs responsible for absorbing oxygen. Pneumonia can result from a variety of causes, including infection with bacteria, viruses, fungi, or parasites, and chemical or physical injury to the lungs. Its cause may also be officially described as idiopathic—that is, unknown—when infectious causes have been excluded. Typical symptoms associated with pneumonia include cough, chest pain, fever, and difficulty in breathing. Diagnostic tools include x-rays and examination of the sputum. Treatment depends on the cause of pneumonia; bacterial pneumonia is treated with antibiotics. Pneumonia is a common illness which occurs in all age groups, and is a leading cause of death among the elderly and people who are chronically and terminally ill. Vaccines to prevent certain types of pneumonia are available. The prognosis depends on the type of pneumonia, the appropriate treatment, any complications, and the person’s underlying health. Pneumonia fills the lung’s alveoli with fluid, keeping oxygen from reaching the bloodstream. The alveolus on the left is normal, while the alveolus on the right is full of fluid from pneumonia. People with infectious pneumonia often have a cough producing greenish or yellow sputum, or phlegm and a high fever that may be accompanied by shaking chills. Shortness of breath is also common, as is pleuritic chest pain, a sharp or stabbing pain, either experienced during deep breaths or coughs or worsened by them. People with pneumonia may cough up blood, experience headaches, or develop sweaty and clammy skin. Other possible symptoms are loss of appetite, fatigue, blueness of the skin, nausea, vomiting, mood swings, and joint pains or muscle aches. Less common forms of pneumonia can cause other symptoms; for instance, pneumonia caused by Legionella may cause abdominal pain and diarrhea, while pneumonia caused by tuberculosis or Pneumocystis may cause only weight loss and night sweats. In elderly people manifestations of pneumonia may not be typical. They may develop a new or worsening confusion or may experience unsteadiness, leading to falls. Infants with pneumonia may have many of the symptoms above, but in many cases they are simply sleepy or have a decreased appetite. Symptoms of pneumonia need immediate medical evaluation. Physical examination by a health care provider may reveal fever or sometimes low body temperature, an increased respiratory rate, low blood pressure, a high heart rate, or a low oxygen saturation, which is the amount of oxygen in the blood as indicated by either pulse oximetry or blood gas analysis. People who are struggling to breathe, who are confused, or who have cyanosis (blue-tinged skin) require immediate attention. If pneumonia is suspected on the basis of a patient’s symptoms and findings from physical examination, further investigations are needed to confirm the diagnosis. Information from a chest X-ray and blood tests are helpful, and sputum cultures in some cases. The chest X-ray is typically used for diagnosis in hospitals and some clinics with X-ray facilities. However, in a community setting (general practice), pneumonia is usually diagnosed based on symptoms and physical examination alone. Diagnosing pneumonia can be difficult in some people, especially those who have other illnesses. Occasionally a chest CT scan or other tests may be needed to distinguish pneumonia from other illnesses. Pneumonia as seen on chest x-ray. A: Normal chest x-ray. B: Abnormal chest x-ray with shadowing from pneumonia in the right lung (white area, left side of image). If antibiotics fail to improve the patient’s health, or if the health care provider has concerns about the diagnosis, a culture of the person’s sputum may be requested. Sputum cultures generally take at least two to three days, so they are mainly used to confirm that the infection is sensitive to an antibiotic that has already been started. A blood sample may similarly be cultured to look for bacteria in the blood. Any bacteria identified are then tested to see which antibiotics will be most effective. A complete blood count may show a high white blood cell count, indicating the presence of an infection or inflammation. In some people with immune system problems, the white blood cell count may appear deceptively normal. Blood tests may be used to evaluate kidney function (important when prescribing certain antibiotics) or to look for low blood sodium. Low blood sodium in pneumonia is thought to be due to extra anti-diuretic hormone produced when the lungs are diseased (SIADH). Specific blood serology tests for other bacteria (Mycoplasma, Legionella and Chlamydophila) and a urine test for Legionella antigen are available. Respiratory secretions can also be tested for the presence of viruses such as influenza, respiratory syncytial virus, and adenovirus. Liver function tests should be carried out to test for damage caused by sepsis. A subsequent study comparing four prediction rules to physician judgment found that two rules, the one above and also were more accurate than physician judgment because of the increased specificity of the prediction rules. Several diseases and/or conditions can present with similar clinical features to pneumonia and as such care must be taken in the proper diagnosis of the disease. Chronic obstructive pulmonary disease (COPD) or asthma can present with a polyphonic wheeze, similar to that of pneumonia. Pulmonary edema can be mistaken for pneumonia due to its ability to show a third heart sound and present with an abnormal ECG. Other diseases to be taken into consideration include bronchiectasis, lung cancer and pulmonary emboli. Upper panel shows a normal lung under a microscope. The white spaces are alveoli that contain air. Lower panel shows a lung with pneumonia under a microscope. The alveoli are filled with inflammation and debris. Pneumonia can be caused by microorganisms, irritants and unknown causes. When pneumonias are grouped this way, infectious causes are the most common type. The symptoms of infectious pneumonia are caused by the invasion of the lungs by microorganisms and by the immune system’s response to the infection. Although more than one hundred strains of microorganism can cause pneumonia, only a few are responsible for most cases. The most common causes of pneumonia are viruses and bacteria. Less common causes of infectious pneumonia are fungi and parasites. Viruses invade cells in order to reproduce. Typically, a virus reaches the lungs when airborne droplets are inhaled through the mouth and nose. Once in the lungs, the virus invades the cells lining the airways and alveoli. This invasion often leads to cell death, either when the virus directly kills the cells, or through a type of cell controlled self-destruction called apoptosis. When the immune system responds to the viral infection, even more lung damage occurs. White blood cells, mainly lymphocytes, activate certain chemical cytokines which allow fluid to leak into the alveoli. This combination of cell destruction and fluid-filled alveoli interrupts the normal transportation of oxygen into the bloodstream. As well as damaging the lungs, many viruses affect other organs and thus disrupt many body functions. Viruses can also make the body more susceptible to bacterial infections; for which reason bacterial pneumonia often complicates viral pneumonia. Viral pneumonia is commonly caused by viruses such as influenza virus, respiratory syncytial virus (RSV), adenovirus, and metapneumovirus. Herpes simplex virus is a rare cause of pneumonia except in newborns. People with weakened immune systems are also at risk of pneumonia caused by cytomegalovirus (CMV). Bacteria typically enter the lung when airborne droplets are inhaled, but can also reach the lung through the bloodstream when there is an infection in another part of the body. Many bacteria live in parts of the upper respiratory tract, such as the nose, mouth and sinuses, and can easily be inhaled into the alveoli. Once inside, bacteria may invade the spaces between cells and between alveoli through connecting pores. This invasion triggers the immune system to send neutrophils, a type of defensive white blood cell, to the lungs. The neutrophils engulf and kill the offending organisms, and also release cytokines, causing a general activation of the immune system. This leads to the fever, chills, and fatigue common in bacterial and fungal pneumonia. The neutrophils, bacteria, and fluid from surrounding blood vessels fill the alveoli and interrupt normal oxygen transportation. The bacterium Streptococcus pneumoniae, a common cause of pneumonia, photographed through an electron microscope. Bacteria often travel from an infected lung into the bloodstream, causing serious or even fatal illness such as septic shock, with low blood pressure and damage to multiple parts of the body including the brain, kidneys, and heart. Bacteria can also travel to the area between the lungs and the chest wall (the pleural cavity) causing a complication called an empyema. The most common causes of bacterial pneumonia are Streptococcus pneumoniae, Gram-positive bacteria and “atypical” bacteria. The terms “Gram-positive” and “Gram-negative” refer to the bacteria’s color (purple or red, respectively) when stained using a process called the Gram stain. The term “atypical” is used because atypical bacteria commonly affect healthier people, cause generally less severe pneumonia, and respond to different antibiotics than other bacteria. The types of Gram-positive bacteria that cause pneumonia can be found in the nose or mouth of many healthy people. Streptococcus pneumoniae, often called “pneumococcus”, is the most common bacterial cause of pneumonia in all age groups except newborn infants. Another important Gram-positive cause of pneumonia is Staphylococcus aureus, with Streptococcus agalactiae being an important cause of pneumonia in newborn babies. Gram-negative bacteria cause pneumonia less frequently than gram-positive bacteria. Some of the gram-negative bacteria that cause pneumonia include Haemophilus influenzae, Klebsiella pneumoniae, Escherichia coli, Pseudomonas aeruginosa and Moraxella catarrhalis. These bacteria often live in the stomach or intestines and may enter the lungs if vomit is inhaled. “Atypical” bacteria which cause pneumonia include Chlamydophila pneumoniae, Mycoplasma pneumoniae, and Legionella pneumophila. Fungal pneumonia is uncommon, but it may occur in individuals with immune system problems due to AIDS, immunosuppresive drugs, or other medical problems. The pathophysiology of pneumonia caused by fungi is similar to that of bacterial pneumonia. Fungal pneumonia is most often caused by Histoplasma capsulatum, blastomyces, Cryptococcus neoformans, Pneumocystis jiroveci, and Coccidioides immitis. Histoplasmosis is most common in the Mississippi River basin, and coccidioidomycosis in the southwestern United States. A variety of parasites can affect the lungs. These parasites typically enter the body through the skin or by being swallowed. Once inside, they travel to the lungs, usually through the blood. There, as in other cases of pneumonia, a combination of cellular destruction and immune response causes disruption of oxygen transportation. One type of white blood cell, the eosinophil, responds vigorously to parasite infection. Eosinophils in the lungs can lead to eosinophilic pneumonia, thus complicating the underlying parasitic pneumonia. The most common parasites causing pneumonia are Toxoplasma gondii, Strongyloides stercoralis, and Ascariasis. Idiopathic interstitial pneumonias (IIP) are a class as diffuse lung diseases. In some types of IIP, e.g. some types of usual interstitial pneumonia, the cause, indeed, is unknown or idiopathic. In some types of IIP the cause of the pneumonia is known, e.g. desquamative interstitial pneumonia is caused by smoking, and the name is a misnomer. Pneumonias can be classified in several ways. Pathologists originally classified them according to the anatomic changes that were found in the lungs during autopsies. As more became known about the microorganisms causing pneumonia, a microbiologic classification arose, and with the advent of x-rays, a radiological classification. Another important system of classification is the combined clinical classification, which combines factors such as age, risk factors for certain microorganisms, the presence of underlying lung disease and underlying systemic disease, and whether the person has recently been hospitalized. Initial descriptions of pneumonia focused on the anatomic or pathologic appearance of the lung, either by direct inspection at autopsy or by its appearance under a microscope. A lobar pneumonia is an infection that only involves a single lobe, or section, of a lung. Lobar pneumonia is often due to Streptococcus pneumoniae. Multilobar pneumonia involves more than one lobe, and it often causes a more severe illness. Interstitial pneumonia involves the areas in between the alveoli, and it may be called “interstitial pneumonitis.” It is more likely to be caused by viruses or by atypical bacteria. The discovery of x-rays made it possible to determine the anatomic type of pneumonia without direct examination of the lungs at autopsy and led to the development of a radiological classification. Early investigators distinguished between typical lobar pneumonia and atypical (e.g. 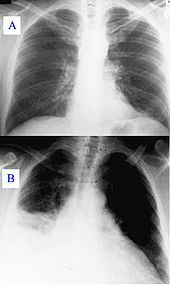 Chlamydophila) or viral pneumonia using the location, distribution, and appearance of the opacities they saw on chest x-rays. Certain x-ray findings can be used to help predict the course of illness, although it is not possible to clearly determine the microbiologic cause of a pneumonia with x-rays alone. With the advent of modern microbiology, classification based upon the causative microorganism became possible. Determining which microorganism is causing an individual’s pneumonia is an important step in deciding treatment type and length. Sputum cultures, blood cultures, tests on respiratory secretions, and specific blood tests are used to determine the microbiologic classification. Because such laboratory testing typically takes several days, microbiologic classification is usually not possible at the time of initial diagnosis. Traditionally, clinicians have classified pneumonia by clinical characteristics, dividing them into “acute” (less than three weeks duration) and “chronic” pneumonias. This is useful because chronic pneumonias tend to be either non-infectious, or mycobacterial, fungal, or mixed bacterial infections caused by airway obstruction. Acute pneumonias are further divided into the classic bacterial bronchopneumonias (such as Streptococcus pneumoniae), the atypical pneumonias (such as the interstitial pneumonitis of Mycoplasma pneumoniae or Chlamydia pneumoniae), and the aspiration pneumonia syndromes. The combined clinical classification, now the most commonly used classification scheme, attempts to identify a person’s risk factors when he or she first comes to medical attention. The advantage of this classification scheme over previous systems is that it can help guide the selection of appropriate initial treatments even before the microbiologic cause of the pneumonia is known. There are two broad categories of pneumonia in this scheme: community-acquired pneumonia and hospital-acquired pneumonia. A recently introduced type of healthcare-associated pneumonia (in patients living outside the hospital who have recently been in close contact with the health care system) lies between these two categories. Community-acquired pneumonia (CAP) is infectious pneumonia in a person who has not recently been hospitalized. CAP is the most common type of pneumonia. The most common causes of CAP vary depending on a person’s age, but they include Streptococcus pneumoniae, viruses, the atypical bacteria, and Haemophilus influenzae. Overall, Streptococcus pneumoniae is the most common cause of community-acquired pneumonia worldwide. Gram-negative bacteria cause CAP in certain at-risk populations. CAP is the fourth most common cause of death in the United Kingdom and the sixth in the United States. An outdated term, “walking pneumonia”, has been used to describe a type of community-acquired pneumonia of less severity (hence the fact that the patient can continue to “walk” rather than require hospitalization). Walking pneumonia is usually caused by a virus or by atypical bacteria. Hospital-acquired pneumonia, also called nosocomial pneumonia, is pneumonia acquired during or after hospitalization for another illness or procedure with onset at least 72 hrs after admission. The causes, microbiology, treatment and prognosis are different from those of community-acquired pneumonia. Up to 5% of patients admitted to a hospital for other causes subsequently develop pneumonia. Hospitalized patients may have many risk factors for pneumonia, including mechanical ventilation, prolonged malnutrition, underlying heart and lung diseases, decreased amounts of stomach acid, and immune disturbances. Additionally, the microorganisms a person is exposed to in a hospital are often different from those at home . Hospital-acquired microorganisms may include resistant bacteria such as MRSA, Pseudomonas, Enterobacter, and Serratia. Because individuals with hospital-acquired pneumonia usually have underlying illnesses and are exposed to more dangerous bacteria, it tends to be more deadly than community-acquired pneumonia. Ventilator-associated pneumonia (VAP) is a subset of hospital-acquired pneumonia. VAP is pneumonia which occurs after at least 48 hours of intubation and mechanical ventilation. SARS is a highly contagious and deadly type of pneumonia which first occurred in 2002 after initial outbreaks in China. SARS is caused by the SARS coronavirus, a previously unknown pathogen. BOOP is caused by inflammation of the small airways of the lungs. It is also known as cryptogenic organizing pneumonitis (COP). Eosinophilic pneumonia is invasion of the lung by eosinophils, a particular kind of white blood cell. Eosinophilic pneumonia often occurs in response to infection with a parasite or after exposure to certain types of environmental factors. Chemical pneumonia (usually called chemical pneumonitis) is caused by chemical toxins such as pesticides, which may enter the body by inhalation or by skin contact. When the toxic substance is an oil, the pneumonia may be called lipoid pneumonia. Aspiration pneumonia (or aspiration pneumonitis) is caused by aspirating foreign objects which are usually oral or gastric contents, either while eating, or after reflux or vomiting which results in bronchopneumonia. The resulting lung inflammation is not an infection but can contribute to one, since the material aspirated may contain anaerobic bacteria or other unusual causes of pneumonia. Aspiration is a leading cause of death among hospital and nursing home patients, since they often cannot adequately protect their airways and may have otherwise impaired defenses. Dust pneumonia describes disorders caused by excessive exposure to dust storms, particularly during the Dust Bowl in the United States. With dust pneumonia, dust settles all the way into the alveoli of the lungs, stopping the cilia from moving and preventing the lungs from ever clearing themselves. Most cases of pneumonia can be treated without hospitalization. Typically, oral antibiotics, rest, fluids, and home care are sufficient for complete resolution. However, people with pneumonia who are having trouble breathing, people with other medical problems, and the elderly may need more advanced treatment. If the symptoms get worse, the pneumonia does not improve with home treatment, or complications occur, the person will often have to be hospitalized. Antibiotics are used to treat bacterial pneumonia. In contrast, antibiotics are not useful for viral pneumonia, although they sometimes are used to treat or prevent bacterial infections that can occur in lungs damaged by a viral pneumonia. The antibiotic choice depends on the nature of the pneumonia, the most common microorganisms causing pneumonia in the local geographic area, and the immune status and underlying health of the individual. Treatment for pneumonia should ideally be based on the causative microorganism and its known antibiotic sensitivity. However, a specific cause for pneumonia is identified in only 50% of people, even after extensive evaluation. Because treatment should generally not be delayed in any person with a serious pneumonia, empiric treatment is usually started well before laboratory reports are available. In the United Kingdom, amoxicillin and clarithromycin or erythromycin are the antibiotics selected for most patients with community-acquired pneumonia; patients allergic to penicillins are given erythromycin instead of amoxicillin. In North America, where the “atypical” forms of community-acquired pneumonia are becoming more common, azithromycin, clarithromycin, and the fluoroquinolones have displaced amoxicillin as first-line treatment. The duration of treatment has traditionally been seven to ten days, but there is increasing evidence that shorter courses (as short as three days) are sufficient. Antibiotics for hospital-acquired pneumonia include vancomycin, third- and fourth-generation cephalosporins, carbapenems, fluoroquinolones, and aminoglycosides. These antibiotics are usually given intravenously. Multiple antibiotics may be administered in combination in an attempt to treat all of the possible causative microorganisms. Antibiotic choices vary from hospital to hospital because of regional differences in the most likely microorganisms, and because of differences in the microorganisms’ abilities to resist various antibiotic treatments. People who have difficulty breathing due to pneumonia may require extra oxygen. Extremely sick individuals may require intensive care treatment, often including intubation and artificial ventilation. Viral pneumonia caused by influenza A may be treated with rimantadine or amantadine, while viral pneumonia caused by influenza A or B may be treated with oseltamivir or zanamivir. These treatments are beneficial only if they are started within 48 hours of the onset of symptoms. Many strains of H5N1 influenza A, also known as avian influenza or “bird flu,” have shown resistance to rimantadine and amantadine. There are no known effective treatments for viral pneumonias caused by the SARS coronavirus, adenovirus, hantavirus, or parainfluenza virus. Because pneumonia affects the lungs, often people with pneumonia have difficulty breathing, and it may not be possible for them to breathe well enough to stay alive without support. Non-invasive breathing assistance may be helpful, such as with a bi-level positive airway pressure machine. In other cases, placement of an endotracheal tube (breathing tube) may be necessary, and a ventilator may be used to help the person breathe. Pneumonia can also cause respiratory failure by triggering acute respiratory distress syndrome (ARDS), which results from a combination of infection and inflammatory response. The lungs quickly fill with fluid and become very stiff. This stiffness, combined with severe difficulties extracting oxygen due to the alveolar fluid, create a need for mechanical ventilation. Pleural effusion. Chest x-ray showing a pleural effusion. The A arrow indicates “fluid layering” in the right chest. The B arrow indicates the width of the right lung. The volume of useful lung is reduced because of the collection of fluid around the lung. Sepsis and septic shock are potential complications of pneumonia. Sepsis occurs when microorganisms enter the bloodstream and the immune system responds by secreting cytokines. Sepsis most often occurs with bacterial pneumonia; Streptococcus pneumoniae is the most common cause. Individuals with sepsis or septic shock need hospitalization in an intensive care unit. They often require intravenous fluids and medications to help keep their blood pressure from dropping too low. Sepsis can cause liver, kidney, and heart damage, among other problems, and it often causes death. Occasionally, microorganisms infecting the lung will cause fluid (a pleural effusion) to build up in the space that surrounds the lung (the pleural cavity). If the microorganisms themselves are present in the pleural cavity, the fluid collection is called an empyema. When pleural fluid is present in a person with pneumonia, the fluid can often be collected with a needle (thoracentesis) and examined. Depending on the results of this examination, complete drainage of the fluid may be necessary, often requiring a chest tube. In severe cases of empyema, surgery may be needed. If the fluid is not drained, the infection may persist, because antibiotics do not penetrate well into the pleural cavity. Rarely, bacteria in the lung will form a pocket of infected fluid called an abscess. Lung abscesses can usually be seen with a chest x-ray or chest CT scan. Abscesses typically occur in aspiration pneumonia and often contain several types of bacteria. Antibiotics are usually adequate to treat a lung abscess, but sometimes the abscess must be drained by a surgeon or radiologist. With treatment, most types of bacterial pneumonia can be cleared within two to four weeks. Viral pneumonia may last longer, and mycoplasmal pneumonia may take four to six weeks to resolve completely. The eventual outcome of an episode of pneumonia depends on how ill the person is when he or she is first diagnosed. In the United States, about one of every twenty people with pneumococcal pneumonia die. In cases where the pneumonia progresses to blood poisoning (bacteremia), just over 20% of sufferers die. The death rate (or mortality) also depends on the underlying cause of the pneumonia. Pneumonia caused by Mycoplasma, for instance, is associated with little mortality. However, about half of the people who develop methicillin-resistant Staphylococcus aureus (MRSA) pneumonia while on a ventilator will die. In regions of the world without advanced health care systems, pneumonia is even deadlier. Limited access to clinics and hospitals, limited access to x-rays, limited antibiotic choices, and inability to treat underlying conditions inevitably leads to higher rates of death from pneumonia. Clinical prediction rules have been developed to more objectively prognosticate outcomes in pneumonia. These rules can be helpful in deciding whether or not to hospitalize the person. There are several ways to prevent infectious pneumonia. Appropriately treating underlying illnesses (such as AIDS) can decrease a person’s risk of pneumonia. Smoking cessation is important not only because it helps to limit lung damage, but also because cigarette smoke interferes with many of the body’s natural defenses against pneumonia. Research shows that there are several ways to prevent pneumonia in newborn infants. Testing pregnant women for Group B Streptococcus and Chlamydia trachomatis, and then giving antibiotic treatment if needed, reduces pneumonia in infants. Suctioning the mouth and throat of infants with meconium-stained amniotic fluid decreases the rate of aspiration pneumonia. Vaccination is important for preventing pneumonia in both children and adults. Vaccinations against Haemophilus influenzae and Streptococcus pneumoniae in the first year of life have greatly reduced their role in pneumonia in children. Vaccinating children against Streptococcus pneumoniae has also led to a decreased incidence of these infections in adults because many adults acquire infections from children. A vaccine against Streptococcus pneumoniae is also available for adults. In the U.S., it is currently recommended for all healthy individuals older than 65 and any adults with emphysema, congestive heart failure, diabetes mellitus, cirrhosis of the liver, alcoholism, cerebrospinal fluid leaks, or those who do not have a spleen. A repeat vaccination may also be required after five or ten years. Influenza vaccines should be given yearly to the same individuals who receive vaccination against Streptococcus pneumoniae. In addition, health care workers, nursing home residents, and pregnant women should receive the vaccine. When an influenza outbreak is occurring, medications such as amantadine, rimantadine, zanamivir, and oseltamivir can help prevent influenza. Pneumonia is a common illness in all parts of the world. It is a major cause of death among all age groups. In children, the majority of deaths occur in the newborn period, with over two million deaths a year worldwide. The World Health Organization estimates that one in three newborn infant deaths are due to pneumonia and WHO also estimates that up to 1 million of these (vaccine preventable) deaths are caused by the bacteria Streptococcus pneumoniae, and 90% of these deaths take place in developing countries. Mortality from pneumonia generally decreases with age until late adulthood. Elderly individuals, however, are at particular risk for pneumonia and associated mortality. In the United Kingdom, the annual incidence of pneumonia is approximately 6 cases for every 1000 people for the 18–39 age group. For those over 75 years of age, this rises to 75 cases for every 1000 people. Roughly 20–40% of individuals who contract pneumonia require hospital admission of which between 5–10% are admitted to a critical care unit. Similarly, the mortality rate in the UK is around 5–10%. More cases of pneumonia occur during the winter months than during other times of the year. Pneumonia occurs more commonly in males than females, and more often in Blacks than Caucasians. Individuals with underlying illnesses such as Alzheimer’s disease, cystic fibrosis, emphysema, tobacco smoking, alcoholism, or immune system problems are at increased risk for pneumonia. These individuals are also more likely to have repeated episodes of pneumonia. People who are hospitalized for any reason are also at high risk for pneumonia. Peripneumonia, and pleuritic affections, are to be thus observed: If the fever be acute, and if there be pains on either side, or in both, and if expiration be if cough be present, and the sputa expectorated be of a blond or livid color, or likewise thin, frothy, and florid, or having any other character different from the common… When pneumonia is at its height, the case is beyond remedy if he is not purged, and it is bad if he has dyspnoea, and urine that is thin and acrid, and if sweats come out about the neck and head, for such sweats are bad, as proceeding from the suffocation, rales, and the violence of the disease which is obtaining the upper hand. However, Hippocrates referred to pneumonia as a disease “named by the ancients.” He also reported the results of surgical drainage of empyemas. Maimonides (1138–1204 AD) observed “The basic symptoms which occur in pneumonia and which are never lacking are as follows: acute fever, sticking [pleuritic] pain in the side, short rapid breaths, serrated pulse and cough.” This clinical description is quite similar to those found in modern textbooks, and it reflected the extent of medical knowledge through the Middle Ages into the 19th century. Bacteria were first seen in the airways of individuals who died from pneumonia by Edwin Klebs in 1875. Initial work identifying the two common bacterial causes Streptococcus pneumoniae and Klebsiella pneumoniae was performed by Carl Friedländer and Albert Fränkel in 1882 and 1884, respectively. Friedländer’s initial work introduced the Gram stain, a fundamental laboratory test still used to identify and categorize bacteria. Christian Gram‘s paper describing the procedure in 1884 helped differentiate the two different bacteria and showed that pneumonia could be caused by more than one microorganism. Sir William Osler, known as “the father of modern medicine,” appreciated the morbidity and mortality of pneumonia, describing it as the “captain of the men of death” in 1918. However, several key developments in the 1900s improved the outcome for those with pneumonia. With the advent of penicillin and other antibiotics, modern surgical techniques, and intensive care in the twentieth century, mortality from pneumonia dropped precipitously in the developed world. Vaccination of infants against Haemophilus influenzae type b began in 1988 and led to a dramatic decline in cases shortly thereafter. Vaccination against Streptococcus pneumoniae in adults began in 1977 and in children began in 2000, resulting in a similar decline. Acon., agar., all-c., ant-c., ant-t., apis., arg-n., arn., ars., ars-i., bad., bell., benz-ac., brom., bry., cact., calc., cann-s., carb-an., carb-s., carb-v., chel., chin., chlor., con., cupr., dig., elaps., ferr., ferr-ar., ferr-i., ferr-p., gels., hep., hippoz., hyos., iod., ip., kali-bi., kali-br., kali-c., kali-chl., kali-i., kali-n., kali-p., kali-s., kreos., lach., lachn., laur., lob., lyc., merc., mill., nat-m., nat-s., nit-ac., ph-ac., phos., psor., puls., pyrog., rhus-t., sabad., sang., seneg., sep., sil., squil., stram., sulph., ter., verat., verat-v.
^ Stedman’s Medical Dictionary, “pneumonia“. Accessed on: November 24, 2007. ^ a b c d e Hoare Z, Lim WS (2006 pages=1077–79). “Pneumonia: update on diagnosis and management“. BMJ 332. doi:10.1136/bmj.332.7549.1077. PMID 16675815. ^ Metlay JP, Kapoor WN, Fine MJ (November 1997). “Does this patient have community-acquired pneumonia? Diagnosing pneumonia by history and physical examination” (PDF). JAMA 278 (17): 1440–5. doi:10.1001/jama.278.17.1440. PMID 9356004. ^ Wipf JE, Lipsky BA, Hirschmann JV, et al (May 1999). “Diagnosing pneumonia by physical examination: relevant or relic?“. Arch. Intern. Med. 159 (10): 1082–7. doi:10.1001/archinte.159.10.1082. PMID 10335685. ^ Syrjälä H, Broas M, Suramo I, Ojala A, Lähde S (August 1998). “High-resolution computed tomography for the diagnosis of community-acquired pneumonia” (PDF). Clin. Infect. Dis. 27 (2): 358–63. doi:10.1086/514675. PMID 9709887. ^ a b Heckerling PS, Tape TG, Wigton RS, et al (1990). “Clinical prediction rule for pulmonary infiltrates”. Ann. Intern. Med. 113 (9): 664–70. PMID 2221647. ^ Emerman CL, Dawson N, Speroff T, et al (1991). “Comparison of physician judgment and decision aids for ordering chest radiographs for pneumonia in outpatients”. Annals of emergency medicine 20 (11): 1215–9. doi:10.1016/S0196-0644(05)81474-X. PMID 1952308. ^ Gennis P, Gallagher J, Falvo C, Baker S, Than W (1989). “Clinical criteria for the detection of pneumonia in adults: guidelines for ordering chest roentgenograms in the emergency department”. The Journal of emergency medicine 7 (3): 263–8. PMID 2745948. ^ Pakistan Multicentre Amoxycillin Short Course Therapy (MASCOT) pneumonia study group (2002). “Clinical efficacy of 3 days versus 5 days of oral amoxicillin for treatment of childhood pneumonia: a multicentre double-blind trial”. Lancet 360: 835–41. doi:10.1016/S0140-6736(02)09994-4. PMID 12243918. ^ Agarwal G, Awasthi S, Kabra SK, Kaul A, Singhi S, Walter SD; ISCAP Study Group. (2004). “Three day versus five day treatment with amoxicillin for non-severe pneumonia in young children: a multicentre randomised controlled trial”. BMJ 328: 791–4. doi:10.1136/bmj.38049.490255.DE. PMID 15070633. ^ el Moussaoui R, de Borgie CA, van den Broek P, Hustinx WN, Bresser P, van den Berk GE, Poley JW, van den Berg B, Krouwels FH, Bonten MJ, Weenink C, Bossuyt PM, Speelman P, Opmeer BC, Prins JM. (2006). “Effectiveness of discontinuing antibiotic treatment after three days versus eight days in mild to moderate-severe community acquired pneumonia: randomised, double blind study”. BMJ 332: 1355–58. doi:10.1136/bmj.332.7554.1355. PMID 16763247. ^ Mufson, MA; RJ Stanek (1999-07-26). “Bacteremic pneumococcal pneumonia in one American City: a 20-year longitudinal study, 1978–1997”. Am J Med 107 (1A): 34S–43S. Department of Medicine, Marshall University School of Medicine. PMID 10451007. Retrieved on 2007-10-18. ^ Combes A, Luyt CE, Fagon JY, et al (October 2004). “Impact of methicillin resistance on outcome of Staphylococcus aureus ventilator-associated pneumonia”. Am. J. Respir. Crit. Care Med. 170 (7): 786–92. doi:10.1164/rccm.200403-346OC. PMID 15242840. ^ Fine MJ, Auble TE, Yealy DM, et al (January 1997). “A prediction rule to identify low-risk patients with community-acquired pneumonia“. N. Engl. J. Med. 336 (4): 243–50. PMID 8995086. ^ Lim WS, van der Eerden MM, Laing R, et al (2003). “Defining community acquired pneumonia severity on presentation to hospital: an international derivation and validation study”. Thorax 58 (5): 377–82. doi:10.1136/thorax.58.5.377. PMID 12728155. ^ Butler JC, Breiman RF, Campbell JF, Lipman HB, Broome CV, Facklam RR (October 1993). “Pneumococcal polysaccharide vaccine efficacy. An evaluation of current recommendations”. JAMA 270 (15): 1826–31. PMID 8411526. ^ “Prevention and control of influenza: recommendations of the Advisory Committee on Immunization Practices (ACIP)” (April 1999). MMWR Recomm Rep 48 (RR-4): 1–28. PMID 10366138. ^ Jefferson T, Deeks JJ, Demicheli V, Rivetti D, Rudin M (2004). “Amantadine and rimantadine for preventing and treating influenza A in adults”. Cochrane Database Syst Rev (3): CD001169. doi:10.1002/14651858.CD001169.pub2. PMID 15266442. ^ Hayden FG, Atmar RL, Schilling M, et al (October 1999). “Use of the selective oral neuraminidase inhibitor oseltamivir to prevent influenza“. N. Engl. J. Med. 341 (18): 1336–43. PMID 10536125. ^ Garenne M, Ronsmans C, Campbell H (1992). “The magnitude of mortality from acute respiratory infections in children under 5 years in developing countries”. World Health Stat Q 45 (2-3): 180–91. PMID 1462653. ^ WHO (1999). “Pneumococcal vaccines. WHO position paper”. Wkly. Epidemiol. Rec. 74 (23): 177–83. PMID 10437429. ^ Almirall J, Bolíbar I, Balanzó X, González CA (February 1999). “Risk factors for community-acquired pneumonia in adults: a population-based case-control study“. Eur. Respir. J. 13 (2): 349–55. PMID 10065680. ^ Maimonides, Fusul Musa (“Pirkei Moshe“). ^ Klebs E. Beiträge zur Kenntniss der pathogenen Schistomyceten. VII Die Monadinen. Arch. exptl. Pathol. Parmakol. 1875 Dec 10;4(5/6):40–488. ^ Friedländer C. Über die Schizomyceten bei der acuten fibrösen Pneumonie. Virchow’s Arch pathol. Anat. u. Physiol. 1882 Feb 4;87(2):319–324. ^ Fraenkel A. Über die genuine Pneumonie, Verhandlungen des Congress für innere Medicin. Dritter Congress. 1884 April 21;3:17–31. ^ Gram C. Über die isolierte Färbung der Schizomyceten in Schnitt- und Trocken-präparaten. Fortschr. Med. 1884 March 15;2(6):185–189. ^ Adams WG, Deaver KA, Cochi SL, et al (January 1993). “Decline of childhood Haemophilus influenzae type b (Hib) disease in the Hib vaccine era”. JAMA 269 (2): 221–6. PMID 8417239. ^ Whitney CG, Farley MM, Hadler J, et al (May 2003). “Decline in invasive pneumococcal disease after the introduction of protein-polysaccharide conjugate vaccine”. N. Engl. J. Med. 348 (18): 1737–46. doi:10.1056/NEJMoa022823. PMID 12724479.